All signed editions from Topping and Company Booksellers are wrapped with great care in protective packaging and shipped securely via courier to ensure safe delivery. Hardcover New and Signed First Edition, First Printing. Dust jacket is in fine condition. 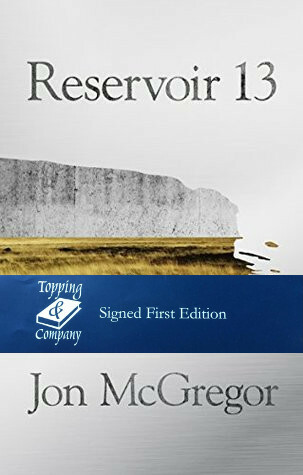 Long listed for the Man Booker Prize 2017, shortlisted for the 2017 Costa Novel Award, and shortlisted for The Goldsmiths Prize – Reservoir 13 is Jon McGregor’s best novel yet, an extraordinary novel of cumulative power and grace, Reservoir 13 explores the rhythms of the natural world and the repeated human gift for violence. All books from Topping & Company Booksellers will be wrapped with great care in protective packaging to ensure safe delivery. Maximum 1 per person. If you would like to order further copies, please contact our bookshop in Bath. If you’re based further afield, we’ll hold books for up to three months, so you can make a day of it! Orders for delivery are usually sent out within 24 hours, but can take slightly longer when our physical bookshops are very busy. For urgent orders, please contact our bookshop in Bath.